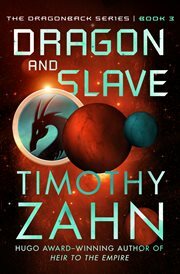 The item DRAGON AND SLAVE;, (ebook) represents a specific, individual, material embodiment of a distinct intellectual or artistic creation found in Charlotte Mecklenburg Library. Fugitive Jack Morgan and dragonlike alien Draycos have become literally inseparable. After Jack rescued him from a crash, the K'da warrior, who must have a host to survive, took residence on his back as a biomorphic tattoo, in return protecting the boy from harm. While Jack tries to clear his own name of a crime he didn't commit, he also helps Draycos uncover a conspiracy to destroy his race. After narrowly escaping service with a band of mercs, Jack and Draycos know that whoever wants the K'da dead was involved with a Brummga alien-brutish beings known to be tough as nails . . . and dumb as rocks. To get more information, Jack's "sold" into slavery on a rich Brummga estate, where he has to find out all he can from the computer system while under the cruel watch of a vicious slave master who has no problem killing the help. It's not going to be easy. But, as always, Draycos has his back . .